If ET is out there, he's doing a great job hiding from us. Six hours a day, seven days a week, for four straight months. That's how long radio astronomer Frank D. Drake pointed the 26-meter telescope at the National Radio Astronomy Observatory (NRAO) research facility in Green Bank, West Virginia, toward the heavens, looking for signs of intelligent life beyond Earth. He dubbed his efforts Project Ozma, in honor of the Queen of Oz from L. Frank Baum's famed children's book series. Between April and July of 1960, Drake recorded some 150 hours of tape speckled with radio noise. While no meaningful encoded signals or patterns emerged from those readings, Drake still earned himself a place in history for performing what would become the first scientific search for extraterrestrial intelligence in the modern era. Since then, research organizations around the world have performed nearly 100 SETI (search for extraterrestrial intelligence) experiments. Even NASA got in on the hunt, working with the SETI Institute between 1988 and 1993, when Sen. Richard Bryan (a Democrat from Nevada) introduced an amendment that cut the program's government funding. "Senators kind of looked at this line item and said, 'Hey wait a minute. Are we are we paying to search for little green men?'" explained Steve Croft, an assistant project astronomer at the UC Berkeley SETI Research Center and researcher with the Breakthrough Discovery project. "That's kind of a laugh factor which has always come along with it." But as the next generation of telescopes come online, like the upcoming Webb Space Telescope or dedicated planet hunter the Kepler Telescope, the scientific community is beginning to warm to the idea of SETI as not just a valid scientific discipline but an essential one. "I think people are kind of coming around to the idea that SETI as a scientific endeavor is one that's worth pursuing," Croft added. Especially, "when we can answer a scientific question or attempt to answer the scientific question are we alone in the universe?" The SETI Institute of California is trying to do just that. The 33-year-old organization formed in 1984 with the mission of understanding the origins and nature of life in the universe. It employs 120 staffers, 75 of whom are PhD-level researchers, and conducts research among 22 fields of inquiry over seven branches of research: astronomy and astrophysics, geoscience, exoplanets and exploration, exobiology and SETI. For its SETI efforts, the Institute relies on radio and optical telescopes. On the radio side, the Institute leverages its Allen Telescope Array (ATA), a 42-dish setup located at Hat Creek Radio Observatory, nearly 300 miles Northeast of San Francisco. It can scan four octaves of radio frequency and generates roughly 55 terabytes of data every day. Unlike conventional radio telescopes used for radio astronomy, the ATA scans a broader swath of the radio spectrum, albeit at a lower sensitivity. The group is also working with Paul Horowitz, a physicist and electrical engineer at Harvard, to develop "all sky all the time optical SETI survey systems" where the ATA would perform wide surveys of the sky while other, more sensitive telescopes -- like the Lick -- would follow up with more focused surveys covering a smaller portion of sky. For its optical surveys, the Institute splits its time between the UC Berkeley's Lick Observatory and the Harvard Haystack telescope. These telescopes are looking for laser emissions, specifically. These could be from any number of alien sources including communication arrays, weapon tests or transportation (hello, laser sails). "But in any case a monochromatic high-intensity highly focused coherent beam of light would be a fairly indicative sign of technology that could potentially be seen from very far away," Bill Diamond, CEO of the SETI Institute explained. However, both the radio and optical instruments have noticeable limitations. While humankind is theoretically capable of blasting a laser beam into space that is 10,000 times stronger than the sun, Diamond continued, "there isn't an instrument on Earth that can detect an Earth-like planet with Earth-like leakage of electromagnetic radiation." This leakage refers to the general emission of radio signals a civilization gives off through its various technologies, rather than powerful, highly focused signals intentionally designed to get another planet's attention. And while using overlapping technologies, as in the case of the SETI Institute-Horowitz collaboration, can boost our relative capabilities, it's still not good enough to intercept complex communications that rely on, say, wideband carrier signals. "We don't want to make too many assumptions about the kind of signals that an extraterrestrial civilization might be sending," Croft said. "It might not be kind of a simple tone. You know a transmission which is a single frequency will have a drifting tone because it is on a planet that's going around a star." Who knows, maybe Frank Drake did find an alien message in that radio static but it's encoded in a manner that researchers haven't yet been able to identify and decipher. "They might be sending some kind of complicated data; we make all sorts of complicated transmissions ourselves as humans," Croft concluded. This technological wall has spurned SETI researchers to seek out more effective means of scouring the galaxy. In the case of Berkeley's Breakthrough Listen project, that involved securing a 10-year, $100 million funding grant from Yuri Milner, a Russian entrepreneur, and physicist Stephen Hawking. This money will be used to buy time on two of the world's most powerful telescopes (the Green Bank in West Virginia and the Parkes in Australia). "We are in a position with the telescopes that we would be able to detect transmissions at a level that is similar to what we ourselves as humans generate," Croft said. "As of right now we're kind of relying on the fact that if civilizations are out there that they're broadcasting to higher power than we are. But we're not very far off being able to detect human-like emissions." Hopefully, as the Square Kilometer Array comes online in Australia and South Africa, that will actually happen. Over the past 18 months, the Breakthrough Listen Initiative has also teamed with the SETI@Home project, run by a team from UC Berkeley, to process a portion of the data generated each day. SETI@Home launched in 1999 as a means of distributing the computational workload that analyzing dozens of terabytes of radio signal data generated by the Arecibo telescope across hundreds of thousands of personal desktop computers. "Actually Berkeley and the SETI Institute have a long history together," Diamond said. "Berkeley was involved with us in the very early days of developing the Allen Telescope Array, so we go back a long time. " The program currently only has around 150,000 volunteers (down from a peak of 1.5 million users) and "we're getting back into our problem again in that the telescope can generate far more data than we can analyze with the best sensitivity," said Dr. Eric Korpela, head of the SETI@Home project. The Breakthrough Listen Initiative has a "pipeline" that divides 1 GHz of spectrum into 3hz channels (330 million in total) that are scanned for potential signals. You want the channels to be as narrow as possible in order to maximize the sensitivity, however, as both the Earth and whatever exoplanet the telescope is looking at move through their respective solar systems, signals tend to "drift" in frequency. "You want to use computer power to correct for that motion," Korpela explained, although the process is incredibly CPU-intensive. But that's exactly what SETI@Home is trying to do. However, even with the million-odd CPU cores at SETI@Home's disposal, analyzing all that data is still slow going. Its volunteers only account for around 2 percent of the Breakthrough Listen Initiative's analytical power. The program simply doesn't have enough volunteers to keep up with the demand. And the fact that many people have ditched their desktops for mobile devices is not helping either. "It is an issue that we worry about," Korpela admitted. "We do have an app for Android. The processors that are in a typical phone right now are not comparable with what are in most desktops, but they're certainly better than a processor from 1999." The app is currently running on 22,000 volunteer mobile devices, or around 15 percent of the total base. However, these devices are only contributing 2.3 TFLOP/s of processing, 0.5 percent of the program's total computational power. As such, SETI@Home doesn't face a technological hurdle in accelerating its search for intelligent extraterrestrial life so much as a societal one. "But given that there are a couple billion Android devices out there," Korpela mused, "there are another 200 petaFLOP/s out there that we haven't tapped yet." The SETI@Home team hopes to garner new interest in their efforts when they release their report from the Breakthrough Listen Initiative this fall. As for the SETI Institute, its technological roadblocks are being resolved with upgrades -- and lots of them. 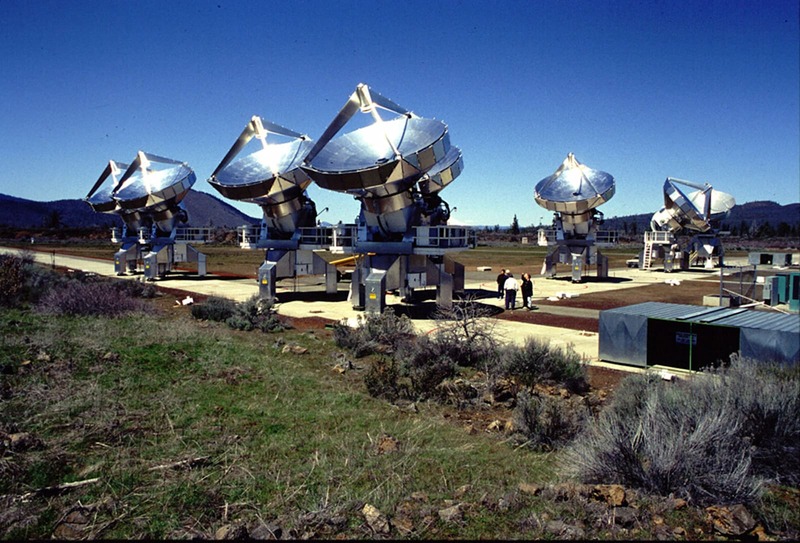 The research group is looking to expand the number of dishes in the Allen Array from 42 to at least 128 in the near term before eventually growing it to more than 300 dishes. The Institute is also improving the sensitivity of its feeds -- the antennas that take the collected radio signals from the dishes and convert them into digital signals -- as well as their frequency response and converting the whole feed system to run cryogenically. "That improves the signal-to-noise ratio," Diamond explained "since heat generates radio noise." Finally, the Institute is looking to upgrade the antennas' backend to enable them to sample more parts of the night sky -- expanding from current three-beam system up to 12. "But even those enhancements probably don't get us to the point of being able to detect Earth-like leakage," Diamond lamented. That's why the SETI Institute is teaming with IBM to apply the company's advanced machine learning algorithms to the Institute's massive data archive. The Institute is already the only SETI group that performs real-time analysis of its collected signals, using fast Fourier transform to look for narrow-band carrier signals that would indicate a non-natural source. The Apache Spark cluster computing tools, however, "have the ability to extract, if it exists, from patterns that, to us, would otherwise look like radio noise," Diamond said. "It's given us the ability to actually do experiments that we've never been able to do before, including possibly detecting an Earth-like planet that's just emitting leakage." Essentially, the Institute can point the ATA at a known exoplanet (or system like TRAPPIST-1), measure the star system's radio signature, then wait for the planet to transit behind the sun and measure the system's radio signature again. If there's a significant difference in the readings, that could mean there's something afoot on that exoplanet. The Institute wouldn't necessarily be able to understand what's encoded in the transmission but it would provide strong impetus for other astronomical research groups to follow up with their own observations. This is actually very close to what the Breakthrough Listen Initiative team is doing, albeit with a less sensitive piece of equipment. And while the SETI Institute (as well as the Breakthrough Listen Initiative and SETI@Home, for that matter) can't say for sure when humanity will find life outside of our own, the group is already cultivating interest in the subject with the next generation. The SETI Institute is sponsoring an IBM hackathon this June -- they're giving teams from around the world access to ATA data as well as to IBM's machine learning tools. The competition will finish up with a live event in San Francisco come August. For now, though, we're still alone (as far as science knows).